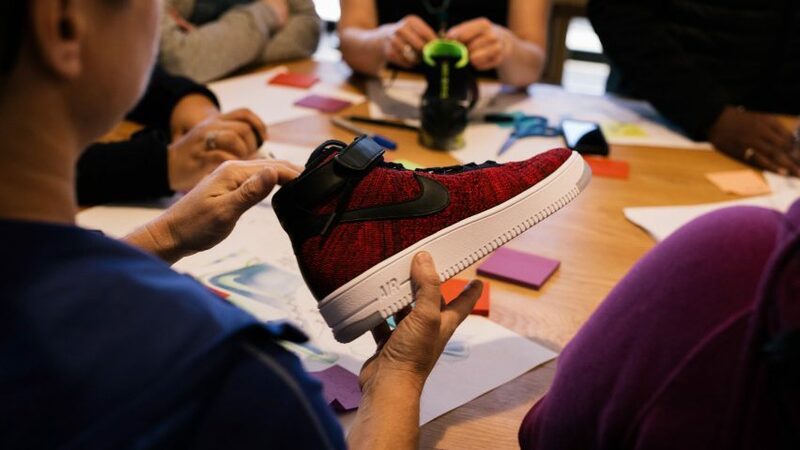 Nike is putting new focus into sustainability, says chief operating officer Eric Sprunk, and has just created a new super material from recyclable natural leather fibre. Speaking to Dezeen at the recent Copenhagen Fashion Summit, Sprunk revealed details about Flyleather, which he described as a "huge breakthrough". The product, which has taken Nike's scientists and engineers years to develop, is claimed to be the lowest carbon-footprint leather material ever made. Sprunk said it will be used in the manufacture of bestselling trainers such as Air Jordan and Air Max, ensuring they retain their style and comfort, but also contribute to the global effort to conserve resources and preserve the environment. Eric Sprunk, Nike's chief operating officer, said Nike's new Flyleather material is a "huge breakthrough"
"Leather is a very high footprint material in our industry," said Sprunk. "I think athletic footwear is one of the top leather industries, behind automobiles, and it has a significant carbon footprint all the way from cows feeding in the fields to dyeing in the hides. "We finally feel we have a breakthrough," Sprunk continued. [But] I'm not going to ask customers to accept sustainability because it's sustainable. We're asking them to have a lighter feeling, more sustainable leather on the shoes that they love – and they're not even going to know it! "They're going to say, 'This is better'. That's a great win. An ugly shoe designed for sustainability: that's no victory." During a typical leather manufacturing process, some 30 per cent of the cow's hide is discarded and often ends in landfill, according to Nike. To reduce this waste, Nike gathers the discarded leather from the tannery floor and turns it into fibres. These are combined with synthetic fibres and a fabric infrastructure via a hydro process of such force that it fuses everything into one material. This then goes through a finishing process, before being put on a roll to be cut to fit the shoes. According to Sprunk, 75 per cent of Nike products already contain some recyclable materials. For example, a dye-colouring process for the soles of Air trainers allows for 99 per cent of recoverable dye water to be recycled; and all the shoe's post-2008 sole innovations are composed of at least 50 per cent recyclable waste. The new VaporMax sole, which contains more than 75 per cent recyclable material, has allowed Nike to remove the need for a layer of foam. "Our rule is: there is no innovation without sustainability," said Sprunk. Sustainability was the main focus of the Copenhagen Fashion Summit, which saw forward-thinking fashionistas meet to discuss the future of their industry from the perspective of social and environmental awareness. Other brands represented at the two-day conference, which is now in its sixth year, were Stella McCartney, H&M and Burberry. However, it was a mark of the event's growing importance, and of Nike's commitment to its sustainability drive, that Sprunk, who usually maintains a low profile, made an appearance. Lucy Jones: You mentioned in your speech that you haven't always been so concerned about sustainability. What changed your mind? Eric Sprunk: We hired William McDonough, to redesign our European headquarters. I worked with Bill, and he's very in tune with making sure the buildings don't interrupt nature. The HQ is now 25 years old. There's grass on the roof. The rain is collected to flush the toilets. That was my first learning. We spent a lot of time together and still do. Out of that I got conviction that, though it may not make the most business sense right now, [thinking about sustainability] is the right thing to do and I think it would be a good innovation challenge for our creative teams. So we gave them a challenge. Once I had some conviction of the fact that once you use sustainability as a catalyst for innovation to get you to solutions you would have never gotten to if you weren't thinking about it from a sustainability perspective. That's pretty powerful. It's easy at Nike to wrap the designers and creatives and innovators around something that will be a catalyst for even better solutions than, "hey it's the right thing to do". It may or may not be compelling to certain individuals. Lucy Jones: When briefing designers, are you asking them to make your products more sustainably, or are you asking them to create something solely with sustainability in mind? Eric Sprunk: We go both ways. It is always good to be pressing what's possible purely from a sustainability perspective. We learn things on that journey. But, we make hundreds of millions of shoes, and hundreds of millions of garments. Our rule is: there is no innovation without sustainability. You cannot go backwards. The next version of this cannot go backwards. It may not leap forwards, but it cannot go backwards. The creative element of the company, and the innovators look on that as a catalyst. It's a new way of thinking, its a new lens that creates solutions that you would have if you just said: "Hey make it lighter', make it less expensive, make it prettier, make it a different colour, oh and by the way, you can't make it with these restrictive substances, it can't have a bigger carbon footprint, you have to used more recycled material, you can't have a much waste". A good design creative exercise needs some constriction to force and guide it. Sustainability is just a part of what we do, it has been for 10 years. Lucy Jones: A large company like Nike has money to invest in responsible innovation. How do smaller companies start their journey to a circular economic future? Eric Sprunk: It's a difficult decision for all size companies. Nike Air is arguably the most well known cushioning platform we have – it's been around forever. To get at this new method of making, we had to stop all the other innovation of Nike Air. Really unpopular. It took several years. So while we were trying to solve for this fluorinated gas issue, we stopped trying to make it more flexible, more lighter, make it thinner, all the stuff you would normally do in a research and development. We didn't have enough money so we had to make a decision: this is important enough for us to take all of the money we dedicate to research and development on Nike Air and put it against driving a [responsible] solution. That took a little bit of convincing. It wasn't that we had resources to spend more. We made a decision to spend just on this. Lucy Jones: Do you think it's important for a big company like Nike to lead this change? Eric Sprunk: I think there are higher expectations on us because of our size and our scale. Great, I accept that. The thing that's going to make the difference between today and three years, is transparency and collaboration. Right now, take the smallest company and us at the other end, we're all going at it with our own agenda. We share a little bit. We're doing transparency but there is zero collaboration on issues like this. I think people look at Nike and think they're never going to collaborate and we're super competitive. Lucy Jones: There's been problems at Nike recently with internal collaboration. How do you plan on convincing external partners that you'd like to be more collaborative? Eric Sprunk: I think everyone in our industry would love us to be more collaborative. So in these precompetitive spaces we've made a commitment. We're not going to solve these problems on our own. Lucy Jones: What do you think you Nike will take on board from smaller companies they partner with? Eric Sprunk: Innovative ideas. This event is the perfect example, everyone here is talking about "pineapple leather", which cracks me up! But there are literally hundreds of ideas. The really difficult thing is to take it to scale but I guarantee, Nike don't have anybody working on pineapple leather! So, inspiration, innovation, creativity, material development. Lucy Jones: What ideas can we expect to see coming up from Nike in terms of innovation? Eric Sprunk: We have tons more. Flyleather is the latest. The more exciting thing about it is, I think we can scale it. I don't criticise the prototype or the small batches but a thousand small batches of a hundred is not going to win the day here. We need companies like Nike with the scale and the breadth to take some of these ideas and scale them, like Flynit, and by having Nike Air be more sustainable. Leather is a very high footprint material in our industry. I think athletic footwear is one of the top leather industries behind automobiles, and it has a significant carbon footprint all the way from cows feeding in the fields to dying the hides. It's a huge breakthrough. We've been working on it for years. We finally feel like we have a breakthrough that we think we can scale and we're not going to say "hey this is the Flyleather shoe made for sustainability". It's going to go on the Air Jordan. It's going to go on the Air Max. That's also really, really important. I'm not asking consumers to accept sustainability because its sustainable, we're asking them to have a lighter feeling, more sustainable leather on the shoes that they love – and they're not even going to know it! They're going to say this is better. That's a great win. An ugly shoe designed for sustainability – there's no victory. Lucy Jones: How much are you learning from your consumers? Eric Sprunk: We listen to the voice of the consumer and learn something every day. Not all consumers from one region of the world has the same lense on sustainability. It's probably more a nuance but there's a nuance the consumer expects from a brand like us in this space so we listen to them all. That's what drives us. And if you're an innovator or creator and you're in our company, your consumer comes first. That's where it starts. Lucy Jones: Are you concerned about what your competitors are doing in this area? Eric Sprunk: I'm not worried about it. A competitive work space is a better. We are always better when we've got a good feel for a competitive market place. Lucy Jones: Do you believe some of the collaboration you've talked about for the future will need to take place with your rivals? Eric Sprunk: For sure. Precompetitive things. Not on the design of our product. I started a forum with all of our competitive brands. I've spent lots of time on the phone with brands. We have got to be more collaborative in these areas. The health and wellbeing in the factory. I don't need to compete with you on having the best audit. I don't need to compete with you on who made the life of the worker better, all of us need to be doing that. All of us should be working towards renewable energy. Lucy Jones: What are you closing thoughts on the matter of social responsibility in the fashion industry? Eric Sprunk: We've got to stop figuring out where we're going to make [a product] and we have to start to figuring out how we're going to make it. We're trying to transform the entire manufacturing supply chain for our product, and in doing so, reimagine where we make it. The job is to transform manufacturing, not just be more sustainable. You cannot transform manufacturing without sustainability. You have to believe that, I think, to drive the innovation that is necessary. We know at Nike it makes our product better. We've lived it. We live it every day and our consumers tell us. If you don't believe it's making your product better and more consistent, more wearable, you're never going to do it. We crossed that bridge 10 years ago. Which is why we can stand up and say we are farther ahead than a lot of other companies. You've got to make a commitment and a belief. A worker who feels empowered is healthy is at work on time and is more productive feels safer, attrition is lower. Training is less. That is important for the health and wellbeing of the worker – it also makes for better shoes and better apparel. And if you don't believe that you're in it for the wrong reason. I hope people say, Nike's not doing this because they believe they're doing the right thing, Nike are doing this because they believe it's more innovative and makes the product better, AND good for the planet, and good for the worker.